1. 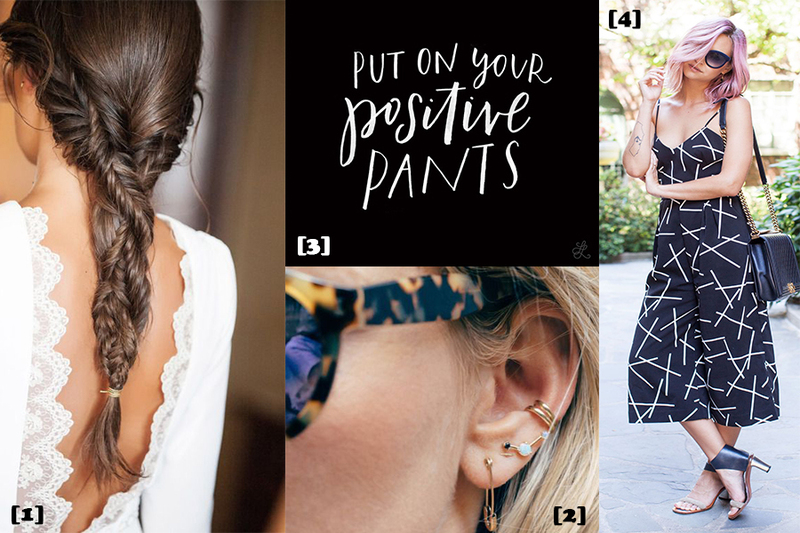 There is no better way to get your hair off your back in the summer than with a pretty braid. And it’s safe to say this awe-inspiring braid has put my fishtail plaits to shame! If anyone could shine some light on how this has been created, it would be much appreciated. 2. Rather than covering myself in tattoos, I rebelled by piercing 11 holes into my ears. Okay, so a couple were carried out by a friend using a needle (I do not condone this), but my piercings include; a triple forward helix, rook and tragus. So why am I telling you all this? Well my lobes are currently bare. I’m in need of some singular earrings and currently on the hunt for some delicately designed mis-matched earrings, like those pictured above. Statement studs are without a doubt an accessory I need. Are there many girls left with just two holes in their ears? 3. Give negativity the middle finger and put on your positive pants. Not only do we all love a little alliteration, thinking positively promotes happiness, increases motivation and production and is contagious. So here I am, sending out the good kinda vibes! 4. As an avid lover of anything ___suit, it wasn’t going to be long until I succumbed to the cropped hybrid culotte jumpsuit. Voluminous at the bottom and fitted on top, these jumpsuits are rather like a midi skirt just grazing below the knee and are a wardrobe must have. I currently have my eye on a cropped scrappy number from Riverland, which I was surprised to find accentuated my curves perfectly.